Have you seen my latest video? It's one I think your class will love. Grrrr! They get to growl and let out frustration (in an acceptable way) and they get to wiggle and release all that energy. Jumping up and down is great way to get oxygen going to the brain and as they follow along they will be developing motor skills and self-regulation. He’d swoop in the swamp then up in the sky. I wish it were here today. Tyrannosaurus Rex, king of the swamp. He ate meat, he was a carnivore. They’d all hide when he would roar. He moved slowly so he would not fall. He ate and ate and then ate some more. I’d like to see one, but now they’re all dead. What does carnivore mean? Herbivore? Are you an omnivore? Apatosaurus is another name for brontosaurus. Give children paper, paint, markers, and other art media to create original dinosaurs. What can you find out about dinosaurs on the internet? What happened to dinosaurs? Students could do informative writing about dinosaurs or creative writing about what they would do if they were a dinosaur. WARNING! I'M ON MY SOAP BOX TODAY SO JUST DELETE IF YOU DON'T WANT TO HEAR ME! School districts may be winning the battle with higher test scores, but they might actually be losing the war in terms of well-rounded and educated citizens. It makes me sad and angry when I hear teachers say things like, “I’m just a data collector. I don’t teach. I just assess and collect data.” When I started teaching over four decades ago we didn’t have to collect data. We TAUGHT our children and we had time to work with them in small groups, individually, and to know their strengths and weaknesses. And, what’s the big deal about a test score? It’s just a number. It doesn’t reflect the whole child – their attitude – their interactions with others – their emotionality – their individuality – their creativity. If you’re reading this blog I know you agree with me. My point today is to share some information from surveys of job skills that major corporations (Target, Microsoft, etc.) look for in employees. I fail to see anything related to a test score, but I do see everything we promote through active learning, working/playing with classmates, centers, games, creative activities…all of the things we’ve done traditionally in early childhood. These are the roots of what our children will need one day to be successful and healthy adults. Where do the three forces in today’s schools (aka tests, rigor, and technology) fit into future needs and goals? When our children construct something with blocks, when they do partner projects, when start and complete a center activity, when they express themselves and teachers have time to listen…when we allow them to do naturally what four, five, and six year olds should be doing we are planting the seeds that will help them the rest of their lives. Take heart, my friends, shut your door, and teach those kids the way you know is best!!! No, I don’t make this stuff up! Check it out for yourself. St. Patrick's Day is right around our corner. Sorry, I don't have a pot of gold, but I have a few "golden" ideas. Hunting for Gold - Spray paint pebbles or rocks gold. (Spread out on newspaper. Spray with gold paint. Dry. Shake. Spray the other side with gold paint. Dry. Shake. Spray a third time.) Hide the pebbles on the playground before children arrive at school. Tell the children a leprechaun hid some gold for them. What fun they will have hunting for the gold nuggets! What If? Have children write stories (or draw pictures and dictate) what they would do if they found a pot of gold. Leprechaun Mischief – While the children are at lunch or on the playground, turn over a few chairs, put books on the floor, and mess up the classroom. Sprinkle a little green glitter around. 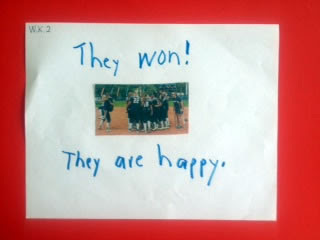 Have the children write stories about what they think happened. Catch a Leprechaun - Challenge children to design “traps” to catch a leprechaun in the block center. Give children an empty sack out on the playground and see who can catch a leprechaun. Green Snack – Eat foods that are green like celery, broccoli, lime jello, snap peas, edamame, etc. You could also use green food coloring to dye cream cheese, milk, yogurt or other snacks. Field Trip - Take a field trip (on the internet) to Ireland. Find Ireland on the globe. How could you get there? Could you go in a car? Why or why not? Math Manipulatives – Spread out dry lima beans on a newspaper. Spray paint one side gold. Dry. Flip over and spray paint the other side gold. These golden nuggets are perfect for making sets, adding, and subtracting. MARCH WINDS WILL BE BLOWING SOON! If you're working on those lesson plans for March this weekend here are a few ideas for you. Paper Plate Kite - Cut the inner section out of a paper plate. Decorate the rim with markers. Glue tissue paper streamers to one side. Punch a hole and tie a piece of string on the other side. Go outside and run to make your kite fly. 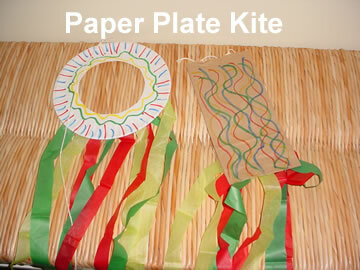 Kite Experiments – Let children make kites out of lunch sacks, plastic bags, and other materials. Have them predict which one will fly best. Experiment to see which one is best. Why did some work better than others? 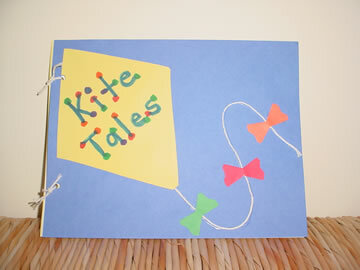 Kite Tales – Ask each child to write a story about what it would be like to be a kite. What could you see? What could you hear? How would you feel? What would you do? Every day ask children what kind of day it is, and then let them color a “lion” or a “lamb” on the calendar. Graph "lion" and "lamb" days and compare at the end of the month. Cut circles and petals out of construction paper. Write each child’s name on a circle. Friends say three nice things about that child. Write those words on the petals and attach to the circle to make a flower. You can make a lovely garden bulletin board from these. I think it's time for a silly song. This song goes to the tune of "Allouette." The kids LOVE it because of the last verse. Peanut butter, that’s what we like best. Yes, we like it on our head. *Is someone in your room allergic to peanuts? Let them explain what an allergy is and why they can't eat peanut butter. Let them choose another food to insert in the song, such as "macaroni" or "watermelon." *Tie in with standards by focusing on the questions and statements. *Cut a sheet of paper in half and then fold in half to make a book. Run off the attached worksheet and let the children put the pictures in the book in sequential order. Your kids will get a kick out of doing the daily schedule in reverse order. Start the day with the good-bye song, eat your dessert first, read a book backwards, etc. I can give the opposite of a word. You can do opposites, opposites, opposites. You say the opposite word after me. 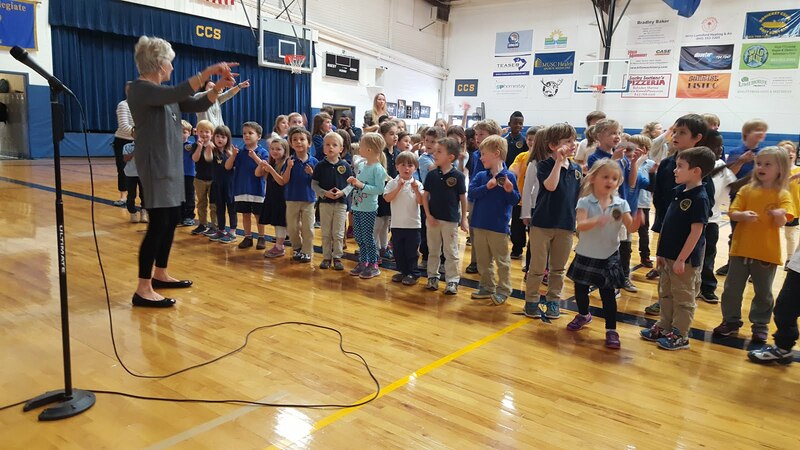 *Let children suggest other antonyms you can sing in the song. Let children act out words that are opposite. Take pictures of children making opposite motions and put them together to make a book. Fold a sheet of paper into eighths. Open and fold in half lengthwise. Cut up on the three creases to the middle fold. Children draw one thing on the front and then open and draw the opposite inside. *Ask children to label their drawings. I can recognize and name end punctuation. 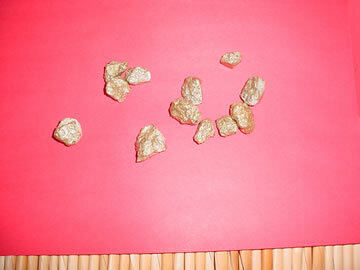 Let children use glass pebbles to find punctuation in books and magazines. *Can they tally how many periods, exclamation, and question marks they find on a selected page? Make a period, exclamation point, and question mark on the ends of jumbo craft sticks. Write simple sentences on a sheet of paper. Children put different sticks at the end of the sentences and read accordingly. *This is fun to do with a friend. I can write a letter for each sound. Place magnetic letters in a bag. One child is the “teacher” and the other child is the “student.” The “teacher” chooses a letter and hides it in her hand. She makes the sound and the “student” writes the letter. The “teacher” reveals the letter and they make corrections. Reverse roles and continue playing. I can work with my friends to write or do research. What can you find out? Collect non-fiction books about a topic that you will be studying in your class. Place the books on a table along with clipboards, paper, and pencils. Let two children work together and take notes to look in the books and see what they can find out (learn) about the topic. Hint! Let your students make their own clipboards from a 9" x 12" piece of corrugated cardboard and a butterfly clip. 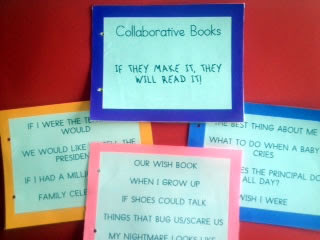 Choose a theme for a class book. Ask the children to write a sentence and then draw a picture that relates to the theme. Let them sign their names on a page that says “Authors and Illustrators.” Bind their pictures together in construction paper to make a class book. Be sure and write “The End” on the last page. Read the book to the class, place it in your classroom library, or let one child take it home each evening to share with their families. WHAT DOES THE PRINCIPAL DO ALL DAY? A NOUN IS A PERSON PLACE OR THING...YEEHAW! I can use nouns and verbs. A noun is a person, place, or thing. Yee haw! 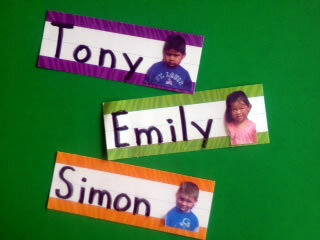 Make name cards for the students in your class from 8” sentence strips. Write each child’s name and glue their picture on the card. Use these for writing prompts in a center. Write nouns and picture clues on 5 index cards and verbs on 5 index cards. 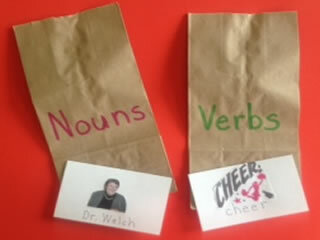 Place them in lunch bags labeled “nouns” and “verbs.” Children choose a noun card and a verb card and write a sentence using the words. Hint! They love to use nouns with their teacher’s name, principal, and other stars. I can make a noun plural by adding /s/ when I say it. Children draw a T-chart on a sheet of paper. On the left side they write the singular form of nouns. On the right side ask them to write the plural form. Can they read the words? 1, 2…sit up, please do. 3, 4…feet flat on the floor. 5, 6…push your chair in quick. 7, 8…lay your paper straight. I can write, draw, and say what happened to tell a story. 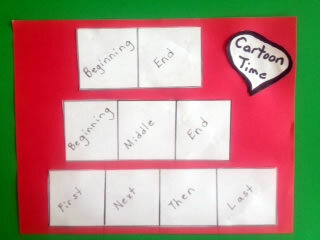 Prepare cartoon frames with two, three, and four sections. 1st - Begin with two frames and ask children to draw/write in the frames what happens to them at the beginning of the day and the end of the day. *Let them use the two frames to draw/write what happened in the beginning and end of a book that was read. 2nd – Ask children to draw/write what happens at the beginning, middle, and end of their day. 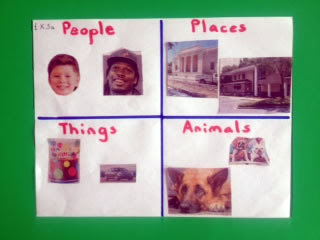 *Use three frames to recall the beginning, middle, and end of a story. 3rd – Encourage children to create original stories with four frames. *Demonstrate how to make dialog bubbles to make their cartoon characters talk. Download art masterpieces or unusual photos from the internet and glue to cardstock. Children take turns choosing a picture and writing stories. What are the people saying? What happened before the picture? What will happen next? I can edit my work to make it better. marker. Underline the punctuation at the end with a red crayon or marker. If they read their sentence and it sounds good they can use the yellow marker to give it a smiley face or a star. Looking for ways to reinforce writing standards? Here are some simple ideas that can be used in a center for independent writing. I can write, draw, and tell my opinion. *Remind children to use as many colors as they are in age when they make their books. Hint! Vary book making with markers, crayons, colored pencils, and other writing materials. I can write, draw, and tell to teach. One thing about being in this business for over four decades is that I’ve been through the revolving door many times. I’m excited about putting a little “STEAM” back in the curriculum by integrating art activities again. Here’s an art/engineering project that my students always enjoyed. Erik Erikson believed that children aged 5-12 were in the age of “industriousness” and needed opportunities to feel confident in their ability to achieve and produce. If you watch children as they work on these projects you can almost see their brains firing away as they create and problem-solve. Decorate one bag with construction paper, markers, paint, and your imagination to look like a building. Open the second bag and stuff with wadded up newspaper. Insert the decorated bag over the stuffed bag to make a rectangular cube. Tie these sack structures in with a unit on community helpers by asking children to make buildings in their community. Let children make places from a book they have read and use them to retell the story. Divide children into small groups and let them collaborate in designing buildings and structures. Can they make a city in the future? Can they make dwellings from other cultures and countries? Now that's what I call building skills for the 21st Century! Cooperation, collaboration, communication, and creativity all rolled into a fun thing for children to do! Oh, what do you say? What is the password for today? *Cut out a giant hand and write the word on the hand. 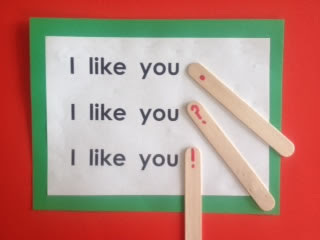 Tape it to the door and every time the children enter or leave the classroom they “high five” the hand and say the word. *Make tally marks on the board for every time a student uses the word during the day. *Go to asl.com and click on the dictionary to learn how to sign the password. Last Friday I did a workshop with some AWESOME Head Start teachers in Berkeley County. They really liked this story and so I told them I’d share it on a blog. It’s simple to make, fun to tell, and reinforces colors and rhymes. I read in a book that there are no words in the English language that rhyme with "purple." Hey, we early childhood educators can make "syruple"! Note! The directions say to make mittens out of felt, but you could also make them out of construction paper. Directions: Cut pairs of mittens from felt using the attached pattern. (You will need brown, white, black, red, blue, green, orange, purple, and yellow mittens for the story.) Place the appropriate mitten on the flannel board as you tell the story. 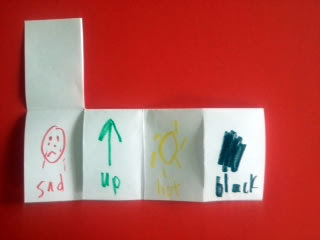 After the children have heard the story several times, encourage them to fill in the missing color word. You could also pass out the mittens to the children and let them hold them up at the appropriate time. Hint! Make a flannel board by stapling the sides of a file folder together. Glue felt to one side. Insert the pieces inside and glue the story to the back. The three little kittens lost their mittens, their brand new mittens of blue. We found some mittens just right for kittens by the bedroom light. We found some mittens just right for kittens in our school backpack. We found some mittens just right for kittens in the washing machine. We found some mittens just right for kittens by the puppet clown. We found some mittens just right for kittens under baby’s bed. We found some mittens just right for kittens by the crayon that’s orange. We found some mittens just right for kittens by a box of Jello. We found some mittens just right for kittens by the maple syruple. We found some mittens just right for kittens in a tennis shoe. *Sing the nursery rhyme about "The Three Little Kittens." *Use the mittens to play a matching game. Ask the children to close their eyes as you hide one of each mitten in the room. Pass out the other mittens to the children and have them “meow” as they hunt around the room and look for their matching mitten. *Make matching games with the mittens where children use a clothespin to clip the mittens that go together. You can make games with upper and lowercase letters, rhyming pictures, sets and numerals, antonyms, and so forth. LOVE ALWAYS CIRCLES BACK TO YOU! ATLAS, OLIVE, POOCH, AND EMMA?? ?